According to the Federal Motor Carrier Safety Administration, there 415,000 police-reported crashes involving large trucks in 2015. Of those crashes, 529 involved a tractor-trailer owned by Schneider Transportation. In the months of March and April of 2017 alone, 16 injuries and four deaths resulted from collisions with a Schneider vehicle. Schneider, among the ranks of UPS, FedEx, Swift, and J.B. Hunt, is one of the five largest trucking companies in North America. 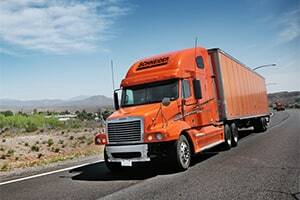 As such, Schneider vehicles are responsible for moving a large percentage of the 10.5 billion tons of freight transported by trucks in the United States annually. Now Schneider is not necessarily a bad company, but any organization with a fleet of 21,937 vehicles on the road will inevitably cause a few accidents. Particularly in an environment where drivers are pushed to cover more miles in less time, stress, fatigue, and distraction can cause any driver, regardless of their training or experience, to get into a collision. The possibility for accidents is greater when a company, like Schneider, hires new drivers fresh out of their training classes. Of course new drivers need to start somewhere, but the odds of stress, fatigue, and distraction can only increase with driver inexperience. Regardless of their hiring policy or training program, Schneider is responsible for the pain, harms, and losses resulting from the accidents caused by the drivers they employ. Schneider tractor-trailer accidents typically result in disputes over the settlement value of the injuries, not over who is liable for those injuries. This should mean that the defendant is of no consequence to the outcome of the case, but in reality, the defendant does make a difference. When suing a sympathetic individual who just happened to cause a single accident, like a Sunday school teacher or a young person who just got her license, this has an impact on jury awards. Though a jury should focus on finding a money award that would accommodate the victim with everything he or she needs to become whole again, sympathy toward the defendant can result in lesser jury awards. But few people feel sympathetic toward big companies like Schneider, even if they respect the company or appreciate its services. As such, the trial value of a personal injury claim can be higher against a company like Schneider, and this higher trial value leads to a higher settlement value. Even more directly, Schneider tractor-trailers are capable of causing more damage than a standard passenger car because of their large size and weight. Because Schneider claims adjusters are accustomed to dealing with these greater damages and their corresponding greater dollar amounts, they can have a positive impact on settlement value. What Else is Different About a Claim Against Schneider? Although many lawyers regularly handle car accident cases, they are not always qualified to handle truck accident cases against Schneider. There are many more tools, like state and federal regulations specifically applying to tractor-trailers or specialized equipment carried onboard big rigs, that can be used to help victims if you know where they are and how to use them. Many commercial vehicles are required to collect and save data about their speed, airbag deployment, braking, and a host of other information from the time of an accident. Plaintiff attorneys can find and utilize data from these modern electronic instruments as long as they know where to find them. There are a number of tools on our website that can be used to help victims determine the potential range of settlement value for their claim. We find it helpful to look at the settlement value for the same type of accident, or even more predictive, the same type of injury. Our website provides statistics for the average trial or settlement value for many of these different factors. Listed below, you can also find examples of verdicts and settlements that have involved Schneider in the past. Although these examples are more limited in their usefulness, they can give you a better understanding of how settlement value can vary depending on the jurisdiction, the severity of injuries, or the economic loss caused by those injuries or death. 2017, New Jersey, $1,450,000 Settlement. A 58-year-old female vehicle driver suffered fatal injuries after she was rear-ended by another vehicle, and propelled through her windshield into the oncoming lane where she was struck by a Schneider tractor-trailer. The woman was not wearing a seatbelt, and was survived by a husband and two adult children. The case settled prior to trial for $1,450,000, including $1,400,000 from the trucking company and $35,000 from the rear striking driver. 2015, Pennsylvania, $38,000 Settlement. The 64-year-old male plaintiff pulled over on the shoulder of a highway due to inclement weather, and was struck by a Schneider tractor-trailer. The plaintiff suffered fractured teeth, post traumatic headaches with vertigo, aggravation of a preexisting lumbar condition, cervical and thoracic strains, and died unexpectedly from unrelated causes before the case concluded. 2012, California, $37,845,883 Verdict. The plaintiffs were a married couple who were passengers in a vehicle driven by a relative when a collision occurred with a Schneider big-rig. The plaintiffs claimed that the Schneider tractor-trailer improperly attempted to pass their car, crossed over into the plaintiff's lane, hit their vehicle, and caused their vehicle to spin out of control across the freeway where it hit the median barrier and was struck by another vehicle. One plaintiff suffered a C5-C6 fracture, spinal fracture and spinal cord injury, and the other plaintiff suffered minor physical injuries and had a claim for loss of consortium. 2010, Indiana, $2,100,000 Verdict. A Schneider tractor-trailer rear-ended the plaintiff's vehicle while it was stopped behind other vehicles for a traffic signal. The vehicle driver suffered fatal injuries, and the passenger, the decedent's mother, sustained a fractured tibia and suffered emotional distress as a result of witnessing the death of her daughter. 2008, Georgia, $2,850,000 Settlement. The 37-year-old male plaintiff suffered bilateral leg fractures and fractures to his left elbow and tibial when his vehicle was struck broadside by a Schneider tractor-trailer at a controlled intersection. The plaintiff contended that the Schneider driver failed to keep a proper lookout, drove at an excessive rate of speed, and failed to yield the right-of-way. 2005, Alabama, $12,500,000 Verdict. A 51-year-old man died when his vehicle was struck broadside by a Schneider tractor-trailer after the driver blacked out while operating the truck. The plaintiff contended that Schneider knew their driver was subject to fainting spells and negligently entrusted their truck to him anyway. 2004, Massachusetts, $410,000 Verdict. At a controlled intersection, a Schneider tractor-trailer struck the 28-year-old male plaintiff's vehicle broadside. As a result of the accident, the plaintiff suffered a traumatic brain injury, headaches, multiple tooth fractures, head lacerations, and a loss in his quality of life. Our law firm is based in Maryland. Most of the truck collision cases we handle are in the Baltimore-Washington area, but we handle significant injury cases throughout the entire country. If you have been harmed in an accident with a Schneider truck and want to consider a lawsuit or a claim for an out-of-court settlement, call one of our lawyers at 800-553-8082 or click here for a free no obligation Internet consultation.